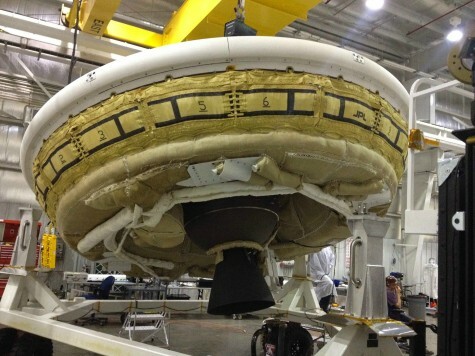 NASA is ready to test a saucer-shaped spaceship, known as the Low Density Supersonic Decelerator (LDSD), in Kauai, Hawaii, on Tuesday. The results of the test will be critical for the future of a potential mission to Mars, NASA said. The battery of tests will include using a rocket-powered balloon-like device called a Supersonic Inflatable Aerodynamic Decelerator to test the functions of the spacecraft. NASA’s goal for the spacecraft is to reach an altitude of 120,000 feet. To help propel the craft vertically, it will use an advanced helium-filled balloon from NASA’s Wallops Flight Facility in Virginia. The balloon is a massive 34 million cubic feet. “At that size alone, one could fit a professional football stadium inside it,” NASA said. At 120,000 feet, the craft will detach from the huge balloon, and a rocket propelled engine will bring the saucer to Mach 4 speeds, which are necessary to push the craft to its capacity. After it maximizes speed, the next step entails slowing the spacecraft down to an acceptable level at which it can deploy its supersonic parachute. NASA’s inspiration for the spacecraft and its technology was apparently found through research on pufferfish. Pufferfish are slow in the water but can gobble up massive amounts of water in a short time, turning themselves into an inedible object. NASA sees this mechanism as a possible technology that may hold the key to the future of space exploration. If it could implement this technology into its spacecraft, NASA claims it can help land heavier objects on Mars. Currently, NASA is using the same technology for decelerating payloads on its 2012 Curiosity Rover that was also used in its 1976 Viking Program that placed two landing devices on the Red Planet. “Future robotic missions to Mars and even future human exploration will require more massive payloads than previously sent to the surface of the Red Planet. To accomplish these goals, we are developing new systems to deliver this important cargo to the surface of Mars,” a statement from NASA said. Once the mission is complete, the test operators hope the balloon and spacecraft will fall safely into the ocean, where the devices can be recovered.